This Mongolian beef recipe is sure to become a family favorite. It is a clean eating recipe that complies with whole 30, paleo, AIP and gluten-free diets. AND it tastes just like your favorite take-out food! This Mongolian beef recipe is an easy dinner idea that will please the whole family. It is ready in about a half hour and is great leftover as well! 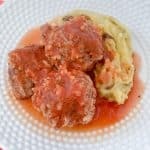 If you are looking for clean eating recipes to add to your recipe box then this one is a keeper! If you love take-out food then you’ll love replacing your weekly take-out with this healthy Mongolian beef instead! We love clean eating and this Mongolian beef doesn’t skimp on flavor! 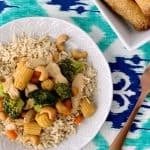 It’s one of our favorite clean eating recipes, along with this pecan crusted chicken and this cashew chicken stir fry! 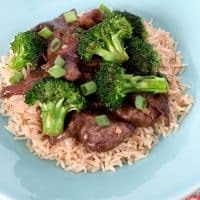 Mongolian beef is really easy to make and our recipe uses clean ingredients and is a recipe for Mongolian beef without cornstarch. I’ll show you how easy it is to make! You’ll need the following ingredients to make Mongolian beef. 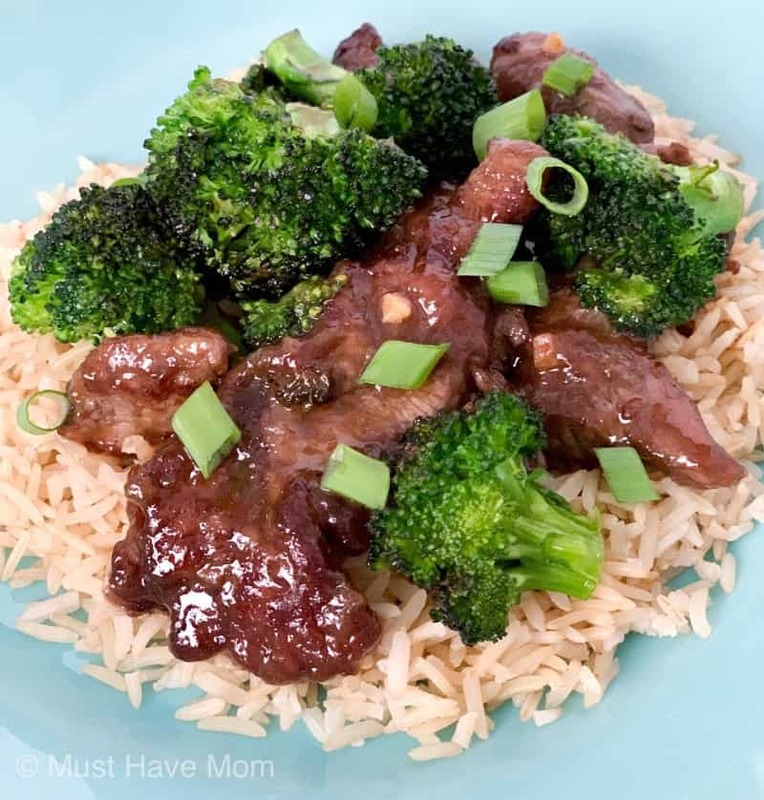 Follow these easy directions to make Mongolian beef and broccoli. In a large skillet or wok, heat 2 tbsp of avocado oil on medium heat (I used this Copper Chef wok). Add broccoli florets and a pinch of sea salt and pepper (omit black pepper if you are on the AIP diet). Cook for 6-7 minutes or until bright green and al dente (slightly firm). 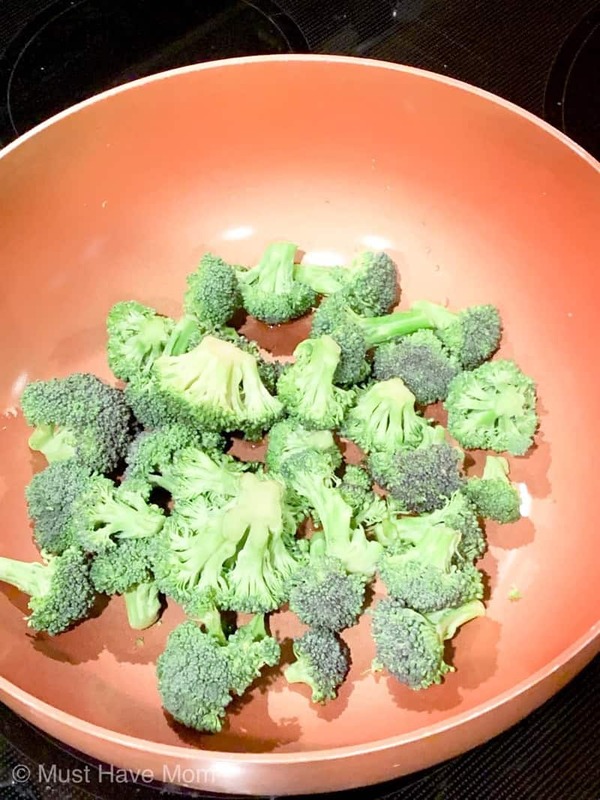 Remove the broccoli from pan and set aside. Then, add salt and pepper to both sides of the flank steak (omit pepper for AIP diet). 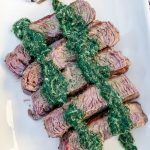 Slice flank steak into thin strips by slicing against the grain. To check this, the slice of steak should have the fibers running up and down the short way and not running horizontally the long way. 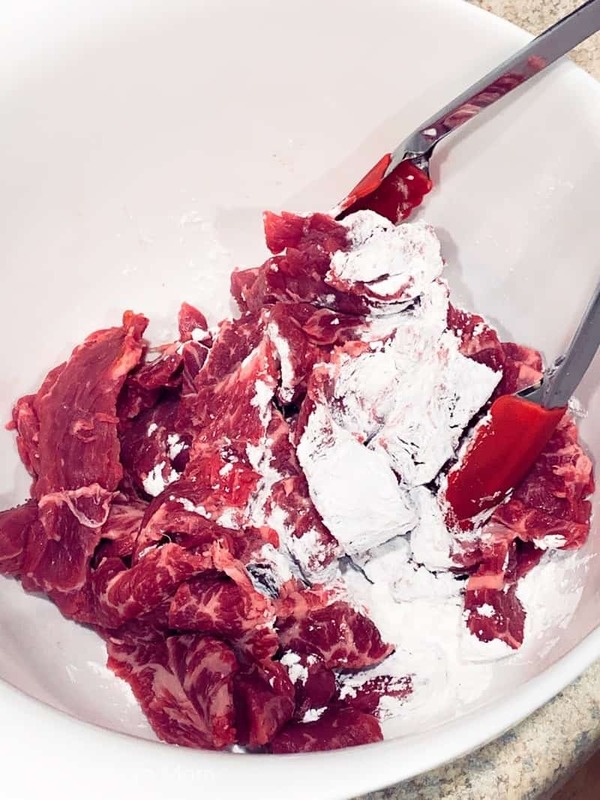 Add the arrowroot starch to a medium size bowl and add flank steak slices. Coat thoroughly. Heat 2-3 tbsp avocado oil in your pan (same pan you used for broccoli) over high heat. Once oil is hot and shimmering, add half of the flank steak slices to the pan. Cook for 2-3 minutes on each side. Continue working until all steak is cooked. Remove from pan and set aside. Add the garlic, ginger, coconut aminos and chicken broth to the pan. Cook for a minute or two and then add steak slices to pan. Cook another couple minutes until Mongolian beef sauce starts to thicken. Add sliced green onions and broccoli to the pan and heat for a minute until warm. Serve over rice or rice noodles. You can also use cauliflower rice if you avoid grains. Easy Mongolian beef recipe that tastes as good as take-out but is a healthier version! This clean eating recipe follows Whole 30, Paleo, AIP, and gluten-free diets. Serve over rice, rice noodles or cauliflower rice. Here are some answer to common questions we receive about Mongolian beef. Our Mongolian beef recipe is healthy! 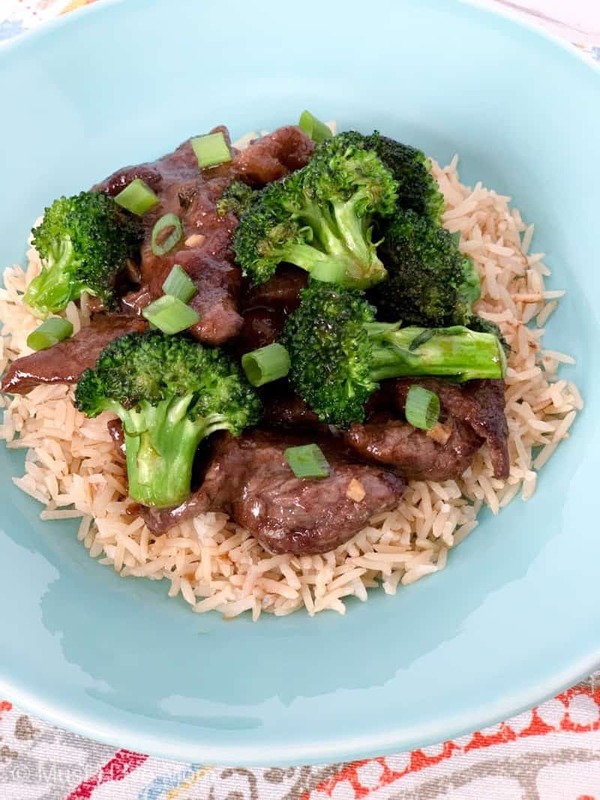 Thanks to clean ingredients our Mongolian beef recipe doesn’t use cornstarch, gluten or any preservatives or chemicals. Much healthier than the take-out version, but just as tasty! Our Mongolian beef recipe is gluten-free! We don’t use any ingredients that contain gluten in this dish. How do you Reheat Leftover Mongolian Beef? We find that the best way to reheat leftover Mongolian beef is to put a little bit of water in a saucepan and add the leftover Mongolian beef to the pan. Heat over medium-high heat just until it’s warm. We typically don’t freeze our Mongolian beef because it is pretty quick to make, however, you can freeze Mongolian beef. To freeze, you can either follow the recipe and cook the dish then freeze and reheat when ready to eat or freeze the broccoli in one bag, the arrowroot starch covered steak slices in another bag and the sauce ingredients in another bag. Thaw and follow recipe directions to prepare.